Okay…so I’m calling this Sea Street meets Amazing Birthday! When I saw the sketch for this week’s Technostamper Monday Lunchtime Sketch Challenge, I decided to step it up a bit even though it is a very CAS sketch. I was looking through my catalog to get inspired and saw the Sea Street and Amazing Birthday on the same page and decided they would work together perfectly for Mary Jo’s Sketch! Stamp banner in Pool Party on Whisper White, cut out with banner Framelit and add to card front using dimensionals. Wrap a piece of Real Red 1/4″ Cotton Ribbon around card with the ends in the front. 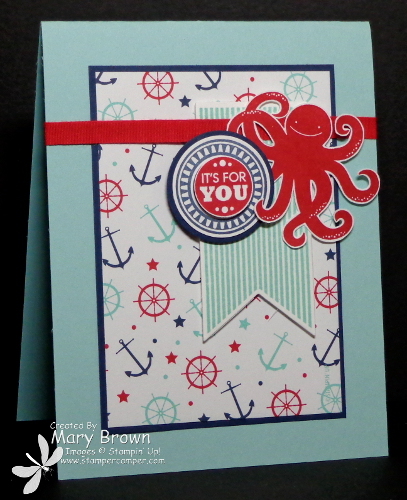 Stamp octopus in Real Real Red, cut out and add to the card front. Stamp the circle greeting in both Night of Navy and Real Red. Punch out the Night of Navy one using the 1 1/4 Circle Punch and the Real Red one with the 3/4″ Circle punch. Layer the 1 1/4 one on 1 3/8″ Night of Navy Circle and the Real Red using a dimensional. Add to card front using dimensionals. What a wonderful sketch this week and just soooo many different things you can do with it! Don’t forget to check out the other members of the team and remember go to the Technostamper blog to play along! This entry was posted in Technostamper Challenge and tagged Amazing Birthday, Sea Street. Bookmark the permalink. Super cute! I have this stamp and haven’t inked up Mr Octopus yet…this is inspiring me to do it! Mary, I always love your Sea Stree cards. My cut-out octopus never looks as good as yours – any tips for cutting him out? Donna — I’m not sure what to suggest. I do love to cut things out so I practice a lot. I use paper snips because really that does give control and then I use a craft blade for the inside parts. Thanks! I guess I’ll just have to practice more ( I use paper snips, too). Love, love love it. I don’t think you can go wrong with this little guy–well actually you can not go wrong with most sets–you are so talented. 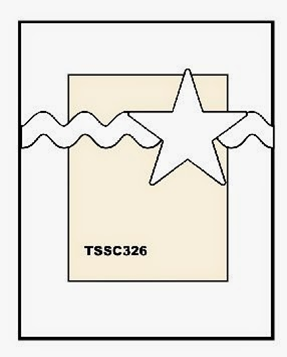 Thanks so much for being a part of the TSSC team!